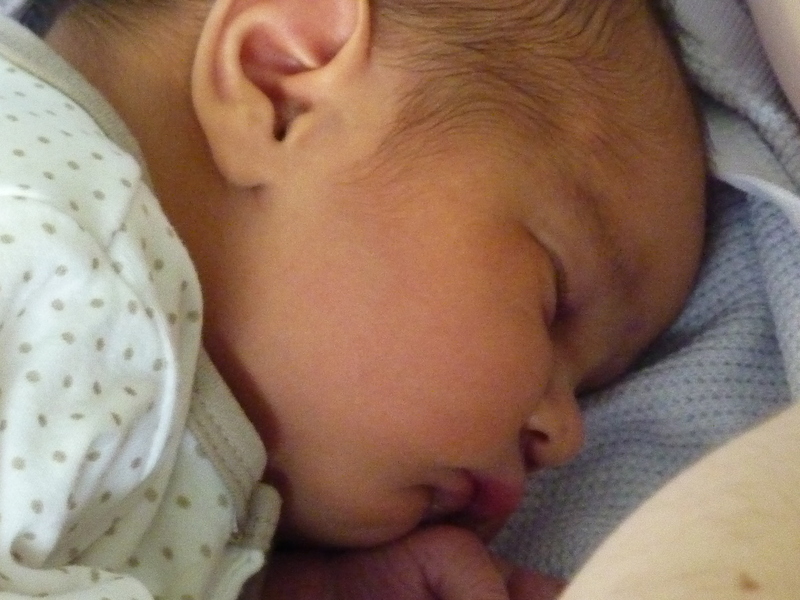 He arrived Saturday, 19th February at 11:19am, weighing in at 3.2 kg/7lbs 1oz. And I’m sure some of you are wondering…but we’ve still not been able to meet our little one. It seems that I’ve made it far too comfortable for junior and he (we think it’s a boy) just doesn’t want to come out. It’s starting to worry me slightly as they’ve now booked me in for an induction tomorrow morning. I wanted to try and avoid an induction at all cost, I’ve only heard horror stories about inductions and have done my research, most of which states that inductions cause a harder, more painful and longer labour…with more chance of mechanical intervention like forceps or even a c-section. I do hope that I go into normal labour tonight…and that this little person comes out naturally. I don’t even mind sharing my birthday with him (I turn 30 tomorrow)! I think I will make all of them at some point, but I just have to decide which one to start with initially. 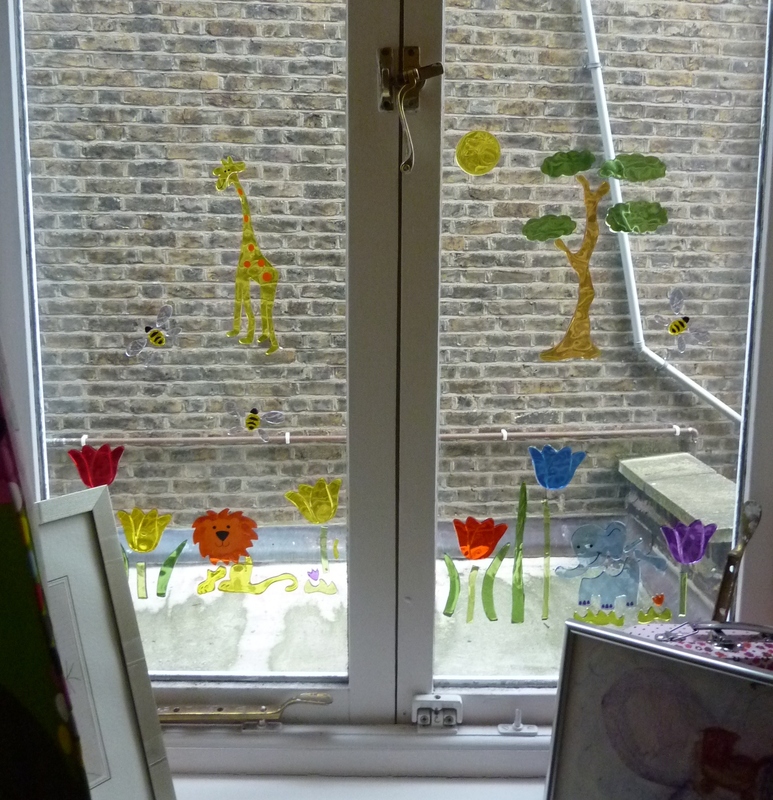 I got some of these gel animals at my work baby shower and liked them so much that when I saw them in a shop window a couple of days ago, I bought some more. We’re not really able to paint the nursery as we live in a rented flat, but that doesn’t mean I can’t make it ‘baby friendly’ by other means. Today is our due date, but there’s no real sign of the baby yet. I’ve been keeping busy with long walks, lots of knitting and watching loads and loads of House (I’m currently on series 3). 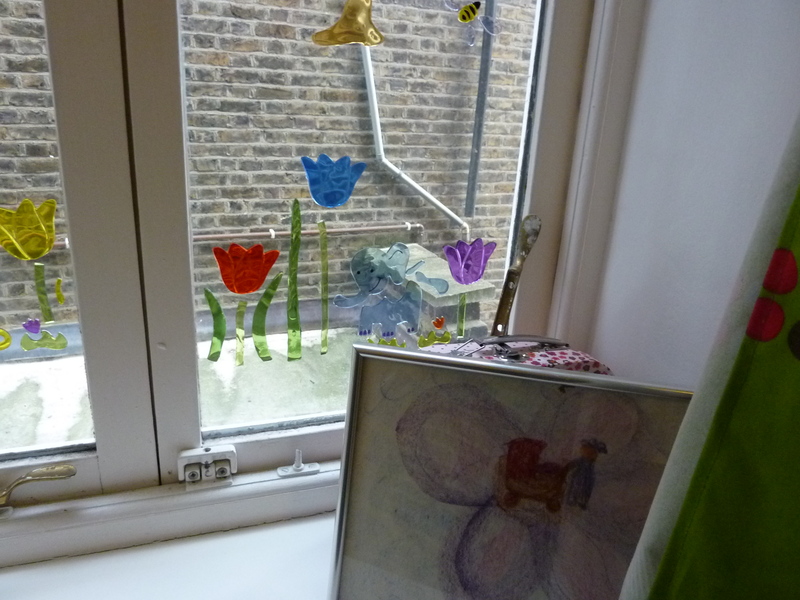 I bought the tulips and bee gels the other day and I think they add that little bit extra to the window…they look nice when the sun shines through them, even though there’s no real sunshine at that side of the house, but it reflects from the other wall. And can you see the picture on the left? 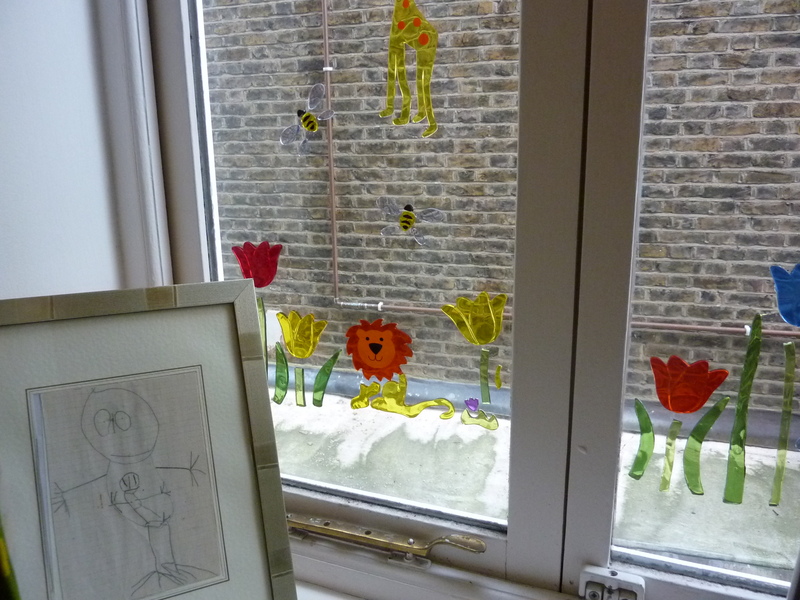 That’s one that I apparently drew when I was little, which my mum recently sent to me. 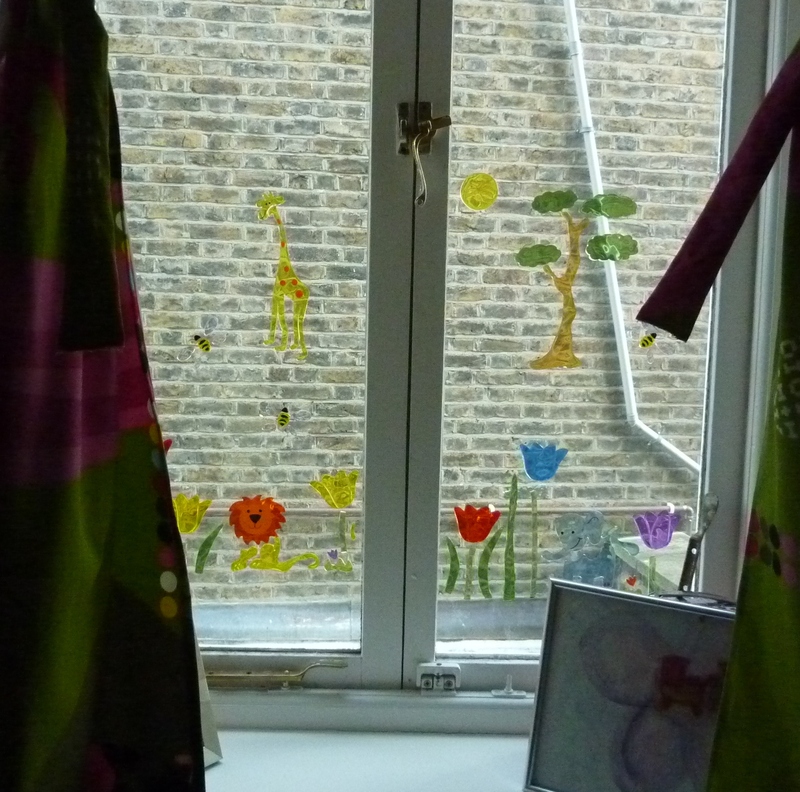 I think it’s adorable and goes so well on the window sill of the nursery. I’m not sure how why I drew a pregnant lady, as my mum never had any other kids apart from me and my twin brother, but I still think it’s cute! And on the right is another drawing I did when I was a little girl. I think it’s great that I can add a little bit of my childhood to the nursery! 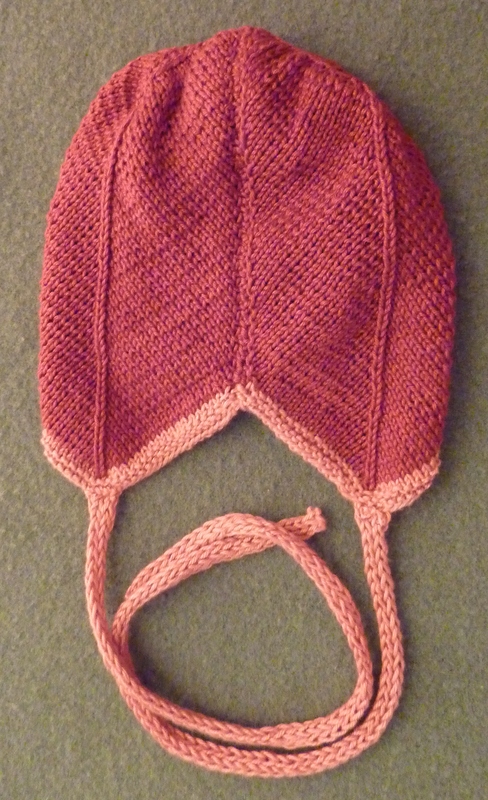 I made this bonnet early last year for a clients little girl. It’s one of my favourite patterns from the team at Garnstudio. I do remember that my client sent me a picture of his little girl with the hat on, but I can’t seem to find it. Nonetheless, it looks very cute on. I know I’ve written about this pattern before, but I’d just like to reiterate that it’s a real joy to knit, as it’s very straightforward and easy. Our due date is fast approaching, it’s this coming Wednesday: 9th February. But there’s no sign of baby yet…I’ve been walking loads the last few days, and I’m sure that it’s helping, but who knows! 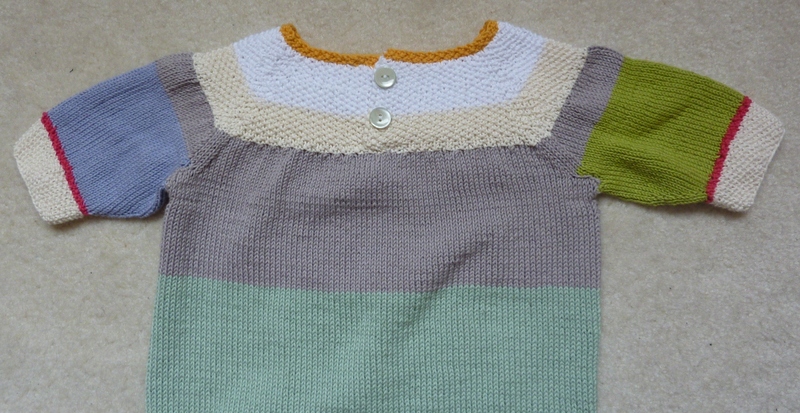 In the meantime, I’m keeping myself busy with some knitting (what else is a girl to do?) 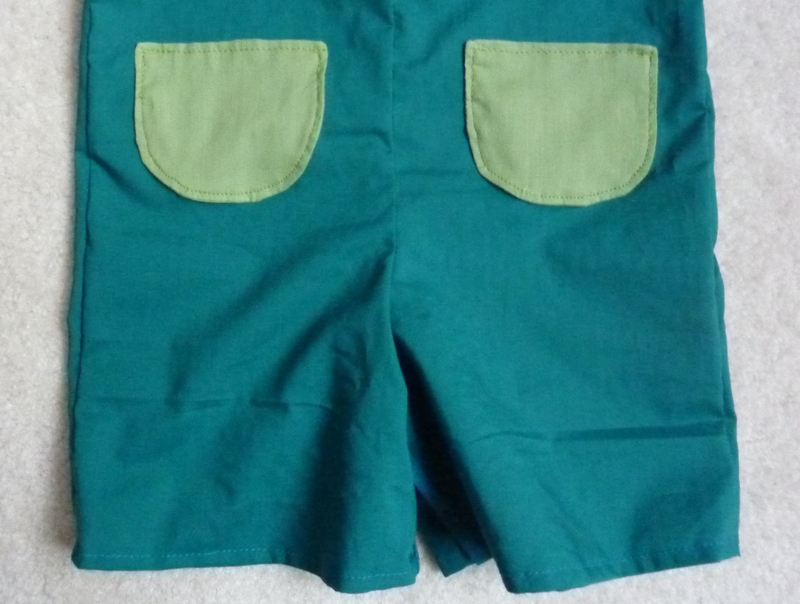 I finished these Summer overalls over the weekend and am really pleased with them. 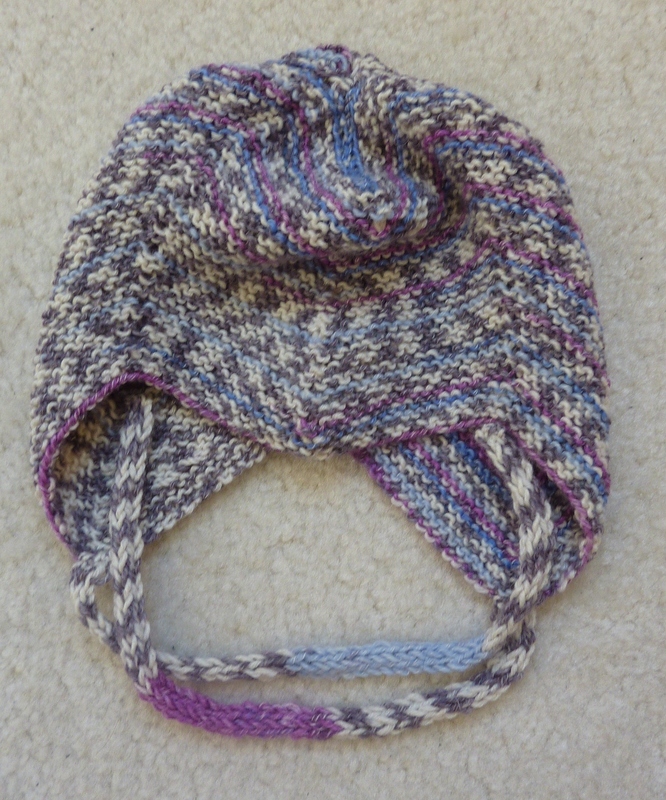 It’s from a pattern over at Garnstudio and was a real pleasure to knit. I’m also pleased with the fact that I was able to use some of my leftover Safran yarn, which I’d been using for bonnets, socks and blankets. That’s why there are a few different colours in these overalls, but I do actually think it worked out really well. 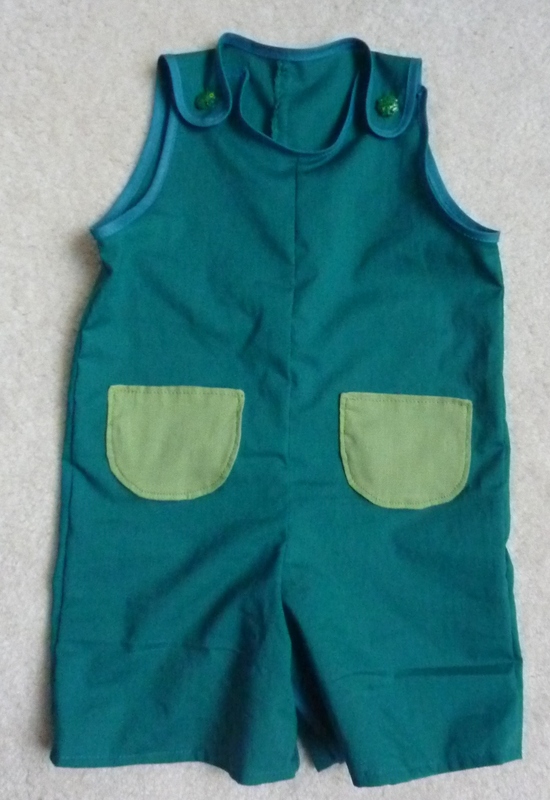 I made the overalls in a 3-6 months size so that baby Prasad can be wearing it during the Summer, now we just have to hope for a hot Summer. The pattern is so easy to knit because it’s really straight forward, apart from the moss stitch at the edges of the legs, arms and the collar it’s basically just straight forward stockinette stitch. The opening in the legs works well and I had some nice buttons that I was able to use here. I think overall the colours work very well together and I especially like the contrast with the pinks in the sleeves and legs, it just gives the overalls that extra ‘je ne se quas’! 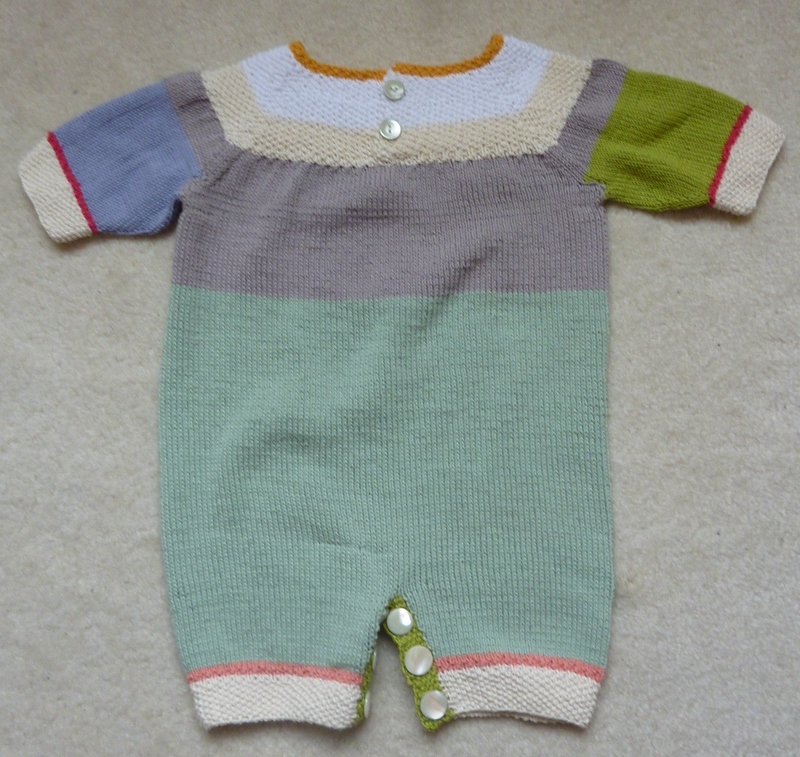 Here’s a jumpsuit I made for my best friend who’s expecting a baby later this year as well, if I remember rightly she’s due in April. 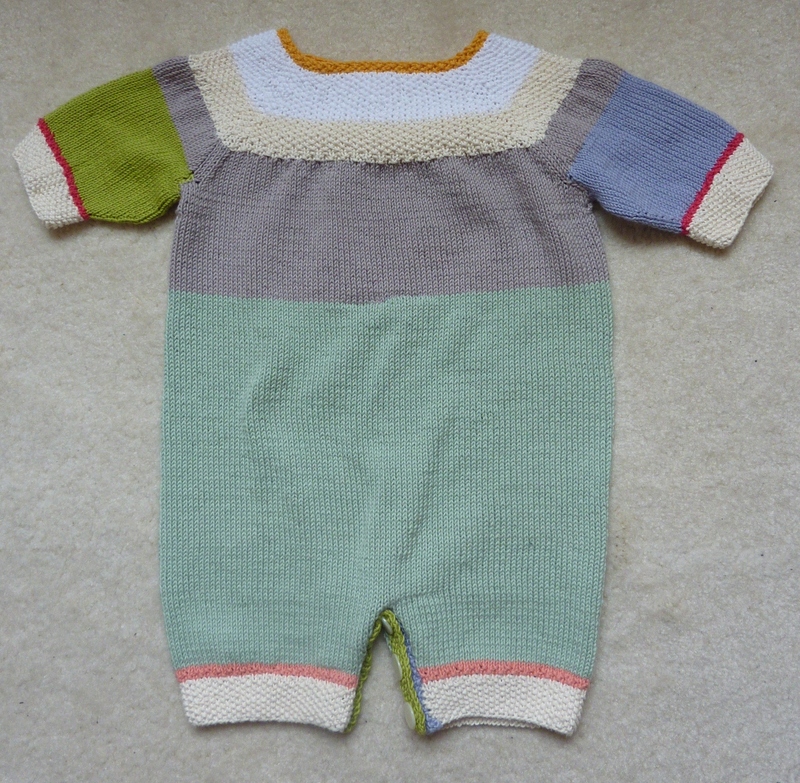 She requested that I make this little jumpsuit for her, after she saw a picture of a previous one I’d made for a friend. It’s a Burda pattern, from a German version of the magazine. She let me pick the colour and even if I say so myself, I think the combination has worked out very well indeed. 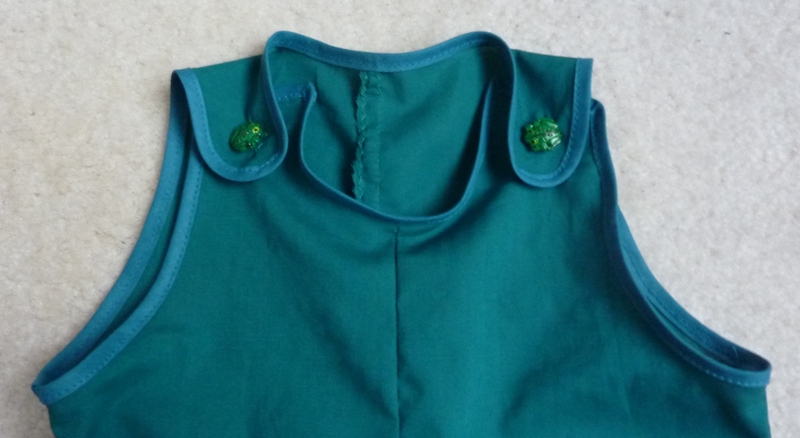 I was particularly pleased that I had the frog buttons in my stash, as I think they work very well indeed with the overalls. They’re more decorative, as I actually put press studs underneath, but nonetheless, they add that little bit extra! I did amend the pattern slightly and just made it a lot easier and quicker. I left out the double facing for the top half as it wasn’t really necessary. 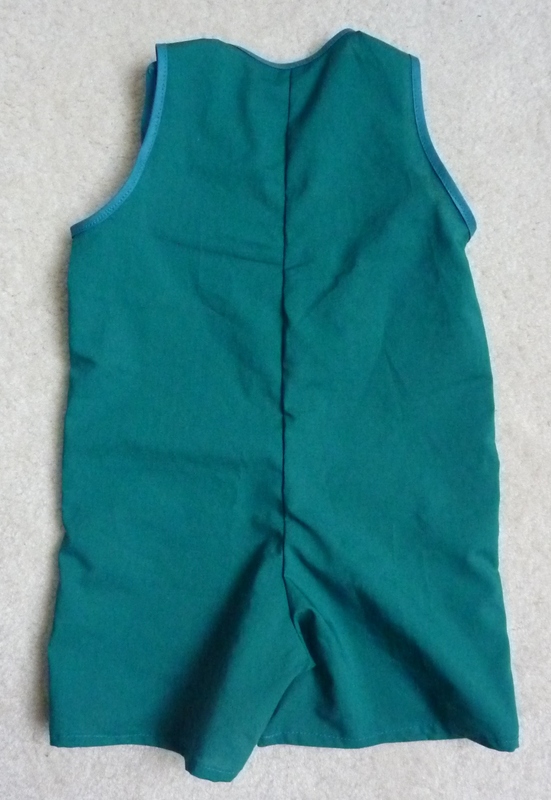 I did also add the biased binding at the top as I think it finishes off the overalls nicely. Obviously the pockets won’t really be used by the little one either, but they also give the overalls that little bit extra. My friends little one is going to look really cute in these overalls in the summer, I’m sure! I hope you’re not getting sick of my bonnet and bootie combo? Both of them are such an easy knit that I always come back to them when I want to make a present for friends. 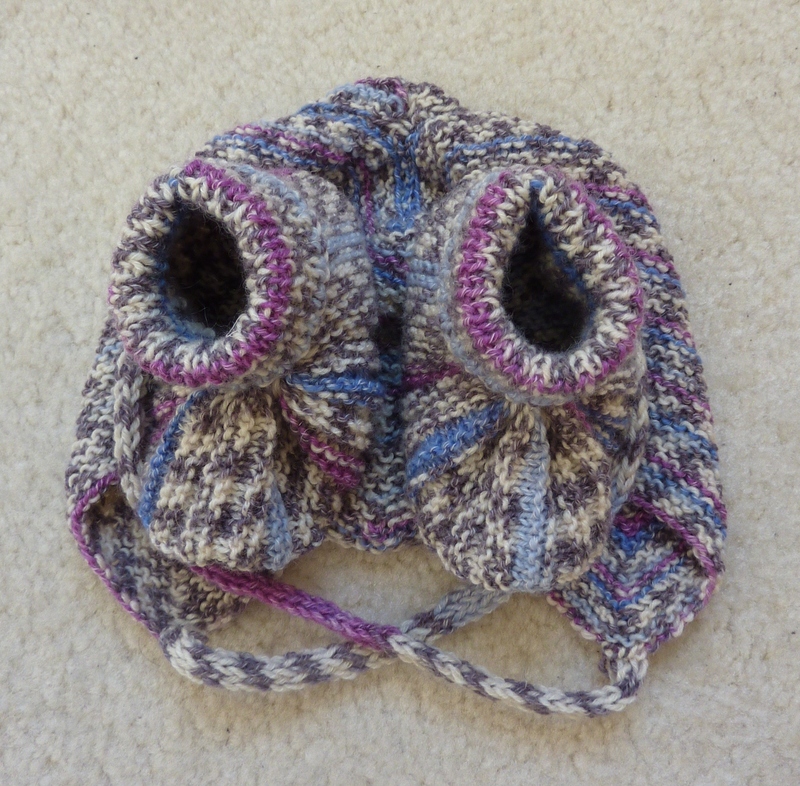 I also like the fact that I can always revert to my stash and use up some leftover wool, like with this pair. The wool I used was sock wool that I bought in Germany many, many years ago. 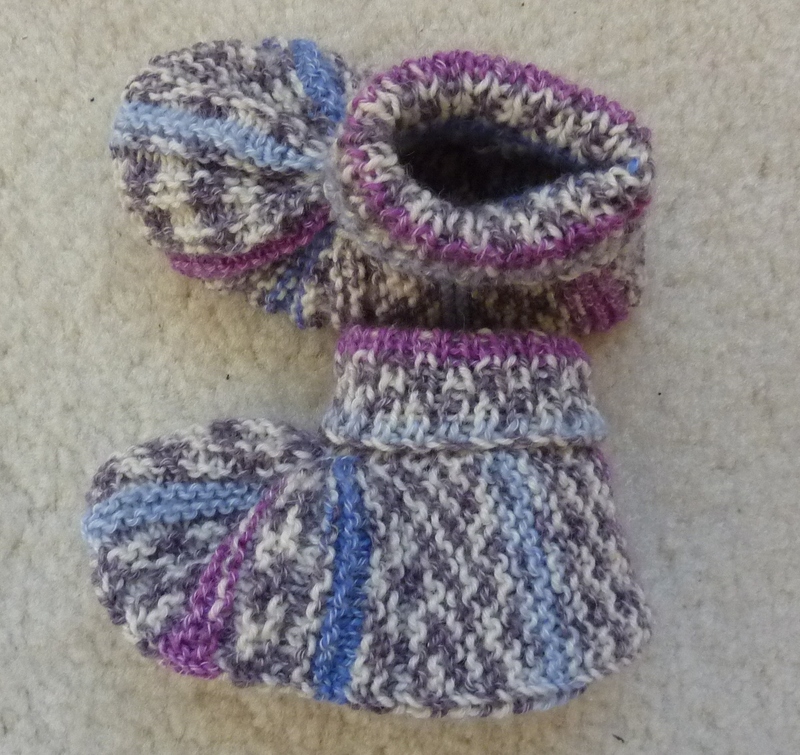 The sock yarn was actually a good idea as they turned out the perfect size for a newborn. 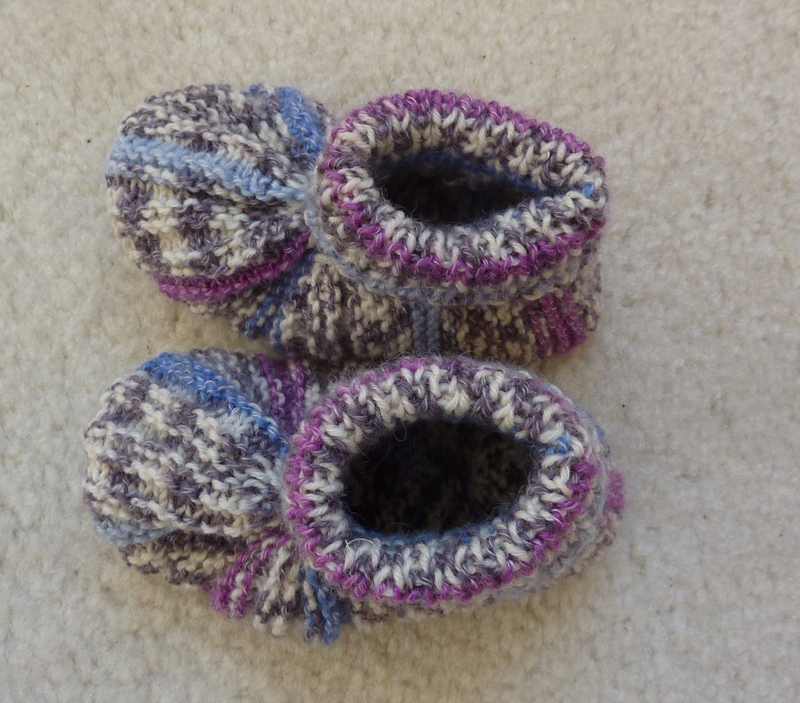 I do also like the fact that the yarn had a mixture of pink and blue that came out as I was knitting the booties. 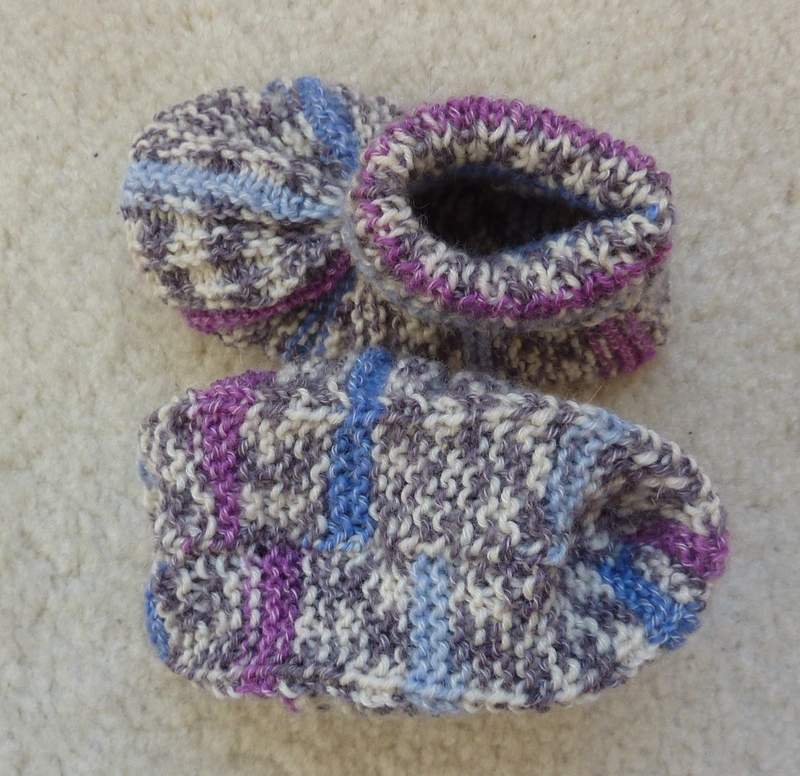 The pattern (my own, in case you didn’t know) is still one of my favourite patterns for booties, especially as I can often knit a pair of booties in an afternoon. 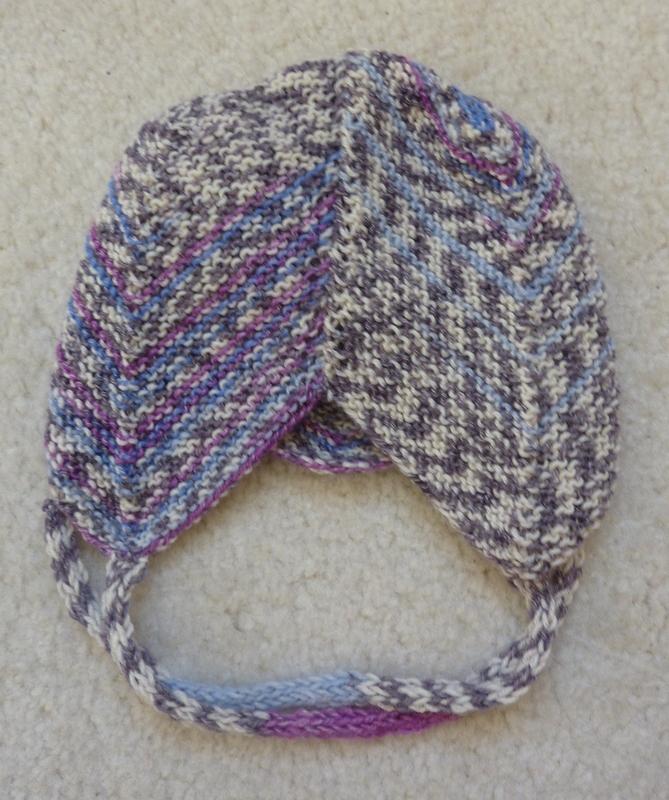 And then there’s the bonnet, another pattern from the guys over at Garnstudio. 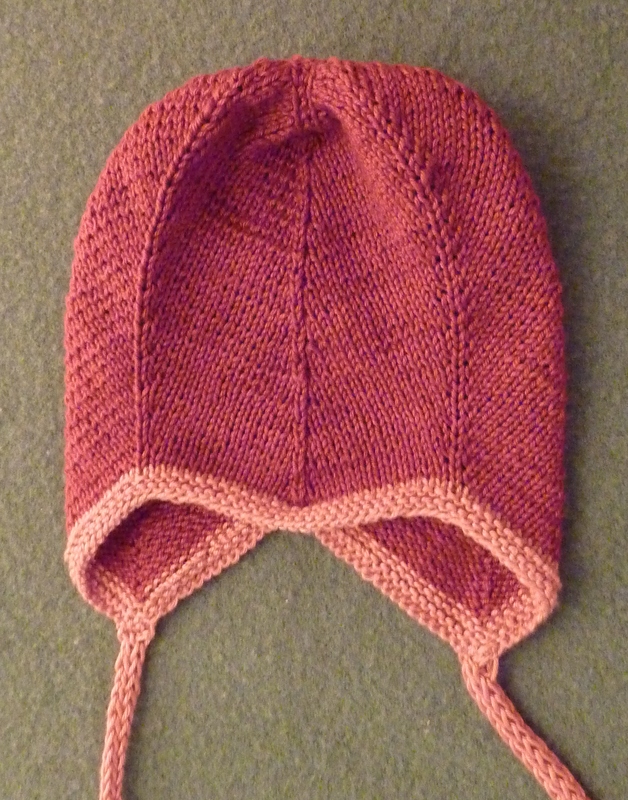 Again, it’s such a great pattern to knit as it takes me virtually no time at all to complete it these days as I’ve knitted so many versions of this bonnet. I remember the first time I made it, I got lost with the instructions, but now it’s like second nature. What do you think of the tie strings? 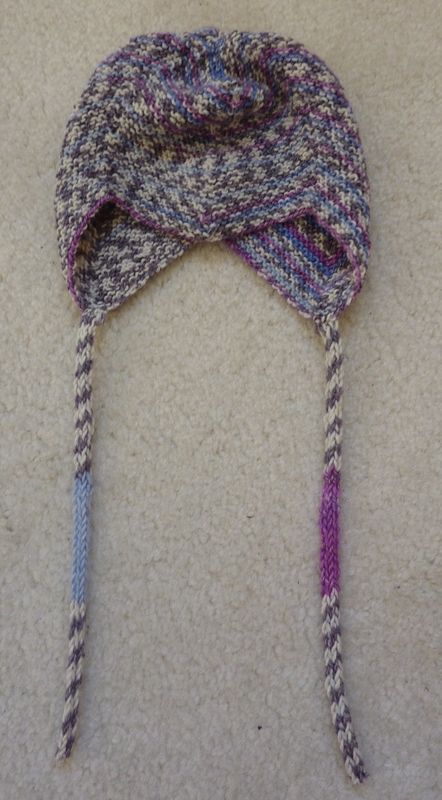 Due to the yarn they’ve worked out fantastically with a pink and a blue side, I love it! Generally the entire bonnet turned out great I think, I simply love the fact that the sock yarn has a built in pattern, I must make sure that I get some more sock yarn from somewhere. I normally try and get some when I’m in Germany, but who knows I might even be able to find some here in the UK or even online. The combo was for a really old school friend of mine who I got in touch again last August as I’m trying to organise a reunion for the class from my first school, I spent my first eight years of school with them and am trying to organise something for this coming year. Which might not be as easy as I thought, as I’ve got a very busy year coming up! Anyway, my friend really loved them and her little girl wore the hat on her first outing!